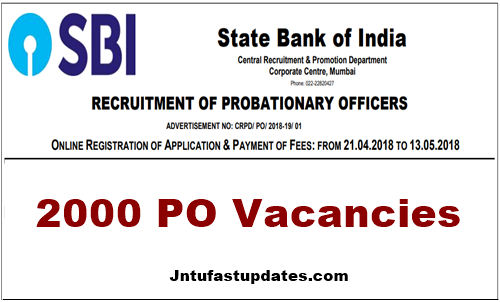 SBI PO Recruitment 2018 – Apply Online For 2000 State bank of india Probationary Officers Vacancies at sbi.co.in: State Bank of India (SBI) has released notification inviting application from eligible candidates for the post of Probationary Officers (PO). The application process for SBI PO 2018 begins from 21st April, 2018. Interested applicants can fill the forms online by registering on the SBI website. The written exam will be conducted in two phases that is Preliminary and Main, followed by a group exercise and an interview. The Preliminary Exam for SBI PO recruitment will be conducted on 1st, 7th & 8th of July 2018 onwards. Any eligible candidate, who aspires to join State Bank of India as a Probationary Officer, is required to register on-line for the Recruitment Process. The examination will be held in three phases i.e. Preliminary examination, Main examination and Group Exercise & Interview. The candidates who are shortlisted after Preliminary examination will have to appear for Main examination. The candidates shortlisted after the main examination will be subsequently called for a Group Exercises & Interview. Prospective candidates will have to apply after carefully reading the advertisement regarding the process of examinations and interview, eligibility criteria, online registration processes, payment of prescribed application fee/ intimation charges, pattern of examination, issuance of call letters etc. and ensure that they fulfil the stipulated criteria and follow the prescribed processes. Candidates are advised to regularly keep in touch with the authorised SBI website www.sbi.co.in/careers for details and updates. Educational Qualification required to apply for SBI PO Job: Graduation in any discipline from a recognised University or any equivalent qualification recognised as such by the Central Government. Those who are in the Final year/ Semester of their Graduation may also apply provisionally subject to the condition that, if called for interview, they will have to produce proof of having passed the graduation examination on or before 31.08.2018. Candidates having integrated dual degree (IDD) certificate should ensure that the date of passing the IDD is on or before 31.08.2018. Candidates possessing qualification of Chartered Accountant may also apply. SBI PO Job Age Limit: (As on 01.04.2018) Not below 21 years and not above 30 years as on 01.04.2018 i.e candidates must have been born not earlier than 02.04.1988 and not later than 01.04.1997 (both days inclusive). Age Relaxation as per Government Rules is applicable. Phase-I : Preliminary Examination: Preliminary Examination consisting of Objective Tests for 100 marks will be conducted online. This test would be of 1 hour duration consisting of 3 Sections. Phase-II : Main Examination: Main Examination will consist of Objective Tests for 200 marks and Descriptive Test for 50 marks. Both the Objective and Descriptive Tests will be online. Candidates will have to answer Descriptive test by typing on the computer. Immediately after completion of Objective Test, Descriptive Test will be administered. Phase – III : Group Exercises (20 marks) & Interview (30 marks): The aggregate marks of candidates qualifying in both the Objective Tests and Descriptive Test will be arranged in descending order in each category. Adequate number of candidates in each category, as decided by the Bank will be called for Group Exercises and Interview. The qualifying marks in Group Exercises &Interview will be as decided by the Bank. Final Selection : The marks obtained in the Preliminary Examination (Phase-I) will not be added for preparing the final merit list for selection. Only the marks obtained in Main Examination (Phase-II), both in Objective Test and Descriptive Test, will be added to the marks obtained in GE & Interview (Phase-III) for preparing the final merit list. The candidates will have to qualify both in Phase-II and Phase-III separately. Presently, the starting basic pay is Rs 27,620/- (with 4 advance increments) in the scale of Rs 23700-980/7-30560-1145/2-32850-1310/7-42020 applicable to Junior Management Grade Scale-I. After successful completion of the payment process, take a printout of completed application form and keep it for future use. For more details about State Bank of India Probationary Officers Recruitment 2018, Examination Centers list etc visit Official notification. All further announcements/ details pertaining to this process will be published/ provided only on SBI authorised website https://bank.sbi/careers or https://www.sbi.co.in/careers from time to time. No separate advertisement will be issues in this regard. 1.3 How to Apply For SBI PO Recruitment 2018? school, bank, post office,railway,office etc.my age is 38.send me where i have to apply.Thanks.